"Jackie Ramone" has the spirit of punk! "Punk is my middle name. I love the freedom and fast beats of punk music. But more than anything else, I love punk fashion! She's wearing a mixture of hard punk looks, styled in a cute way. The faux leather Union Jack skirt on her one piece is topped with a bold yellow, plaid on the bodice. There is a small lace trim along the hem of the dress. This is a graphic design with impact! Her punk look is complete with faux leather jacket and tall boots. Her sunglasses are a new shape, with thicker frames. She has a cute bob hair cut with straight bangs and a slight body wave perm. This slight perm helps keep her hair in a cute, round style. Her hair color is dark brown and red. She wears light grey eyeshadow and pink lipstick and blush. She has light brown eye, and fair skin. 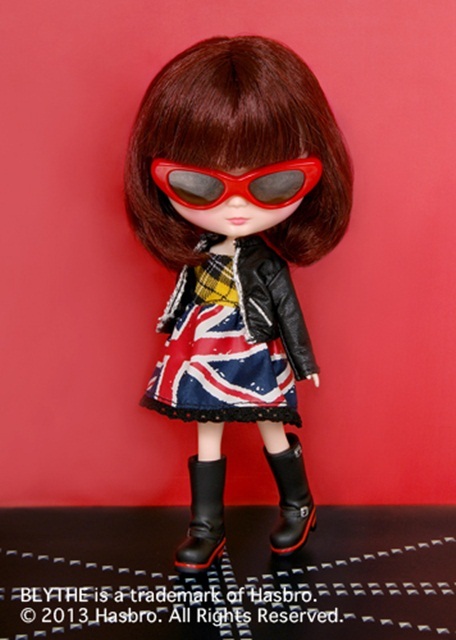 Set includes: Doll, dress, jacket, boots, sunglasses, shorts, and stand. 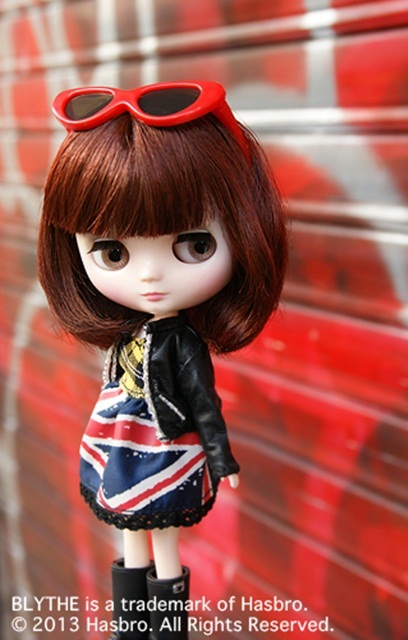 Copyright (c)★あいらぴ★ブライスざんまい★ Blythe All Rights Reserved.